Breathe in. You are breathing in life. Without air, we would not be able to live. The air which surrounds the earth is called the atmosphere. The atmosphere we breathe is made up of molecules (tiny units) of gasses. The main gasses in our atmosphere are nitrogen (78%) and oxygen (about 21%). 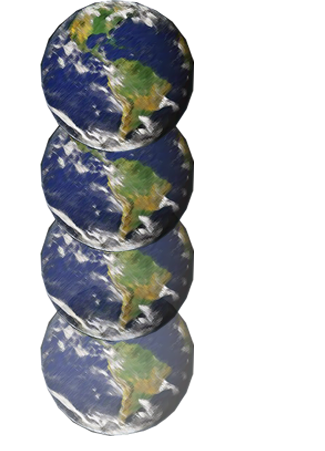 Most of the earth’s atmosphere is within the first ten miles from the surface, but the further from the surface the atmosphere gets thinner and thinner until it merges with outer space. The air in our atmosphere is important for almost all life on earth including plants and animals. Plants need carbon dioxide and with sunlight, give off oxygen in a process called photosynthesis. People and animals need oxygen in their blood to live, which is taken in through the lungs. 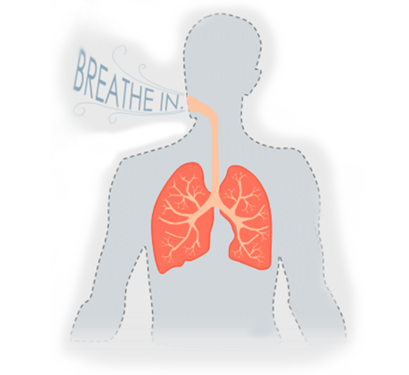 On average people breathe in 20,000 liters or 20,000 breaths in and out everyday!! Catch your breath! Breathe air! Activity 1 – How heavy is air? Air is actually fluid in that it moves fluidly. As we live and breathe, we are actually displacing air molecules as we move through them. In a way, we are ‘swimming’ in air. Air is matter and therefore has weight. Watch Balancing Balloons: Air Has Weight and How Heavy is Air?, the TEDed lesson to learn more about air molecules. Air molecules create high and low pressure as it pushes on us and on weather systems or moves from high altitude to low altitude. When we breathe we breathe in air molecules. We say the air is heavy when it is full of water. We call this humidity. Activity 2 – What Do You Hear, See, and Smell? For one week, walk out of the door of your house to your street. Look, listen and smell. Record what your senses tell you about the environmental air quality where you live. Do you hear birds singing or traffic driving? Do you smell green earth or car exhaust? Do you see clear blue skies or stars at night or hazy dust, fog, and smoke? Be aware of the health of the environment where you live. Check your daily newspaper for the Air Quality Index. Research your zip code for annual AQI recordings and make a pie chart showing the percentage of clean air vs. degrade air quality days. Notice what you are breathing in! It’s all about the air! Print a world map. Research the most polluted areas in the world. Make and color your map showing which areas have the poorest air quality with shades of brown. What did you find? Where are the areas where the air is the most polluted? Are they urban or rural? What causes pollution? It’s all about the air! Take a look at the earth’s atmospheric layers. The atmospheric layer closest to us is the troposphere. The next layer is the stratosphere. Above the stratosphere is the mesosphere. The fourth layer is the thermosphere. The air is thinner higher in the atmosphere because the pressure is lower the higher you go up. Make a poster of the layers and show details about each one. Write a short paper defining smog. Who first coined the word? What does it mean? Where does it accumulate? Is it seasonal? Make a cover to your paper showing pictures of smog. Include in your typed paper at least five paragraphs (introduction, definition, types of smog, location of smog, and effects of smog). Include a bibliography of resources. Research the history of the EPA Environmental Protection Agency. When was it organized? What was its original purpose? WHat is its mission today? Write a short paper (five paragraphs) about the EPA and its initiatives. Earth is the only planet that we know that has an atmosphere that sustains human life as we know it. There is more air lower or higher in the earth's atmosphere? Smithsonian How long can a person hold their breath? TEDed How Heavy is Air? Video Bill Nye the Science Guy What is Wind?